Cuba’s “de-dollarization program” was initiated with the approval of Resolution No. 65 by the Banco Central de Cuba (BCC) on July 23, 2003. Resolution No. 65 established the convertible peso (CUC) as the only acceptable currency for all entities that had previously accepted U.S. dollars; mandated the conversion of their U.S. dollar holdings to convertible pesos and the sale of any excess foreign currency to the BCC at the official exchange rate; and required state firms to pay the BCC a service fee ranging from 1% to 2% of the value of any hard currency purchases from the Central Bank (“Resolución No. 65” 2003). The process of de-dollarization was accelerated with the approval of Resolution No. 80 on October 23, 2004. Resolution No. 80 explicitly guaranteed the legal possession of unlimited quantities of U.S. dollars by the population, but required all entities that had previously accepted U.S. dollars to only accept convertible pesos; and established a 10% service charge (gravamen) on exchanges of U.S. dollars for convertible pesos and “old” Cuban pesos after November 8, 2004 (“Resolución No. 80” 2004). After this date, foreign visitors and Cuban citizens were encouraged to exchange U.S. dollars for euros, Canadian dollars, British pounds, and Swiss francs, and use any of those currencies to acquire convertible pesos to avoid paying the 10% surcharge (“Resolución No. 80” 2004). According to Resolution No. 80, withdrawals from existing U.S. dollar bank accounts, and convertible peso fixed term deposits and certificates of deposit (CDs) are exempt from the 10% levy, and their original terms remain unaffected (“Resolución No. 80” 2004). Principal and interest payments for these accounts can be made in U.S. dollars or convertible pesos without incurring the 10% fee (“Resolución No. 80” 2004). Although cash deposits of U.S. dollars into existing bank accounts are no longer permitted, the BCC may permit U.S. dollar deposits into existing accounts on an exceptional basis, but such transactions are subject to the 10% fee (“Resolución No. 80” 2004). As a complement to Resolution No. 65, the BCC introduced Resolution No. 92 on December 29, 2004. Resolution No. 92 increased the state’s control over foreign exchange transactions by creating a centralized hard currency account at the Central Bank to monitor transactions in excess of $5,000 (“Resolución No. 92” 2004). Dividends, royalties, and any other type of earnings from joint ventures between Cuban firms and their foreign partners must be deposited into this account (“Resolución No. 92” 2004). In addition, after February 1, 2005, all foreign exchange transactions by entities from the Ministries of Basic Industry, Construction, Fishing, Food, Informatics and Communications, Iron and Steel, and Tourism, as well as all enterprises operating the international network of stores that accept convertible pesos or hard currency were centralized in a single hard currency account at the BCC. All other enterprises, operating in convertible pesos or foreign exchange, are required to establish contracting committees, with the participation of members of the BCC’s Hard Currency Approval Committee (Comité de Aprobación de Divisas, CAD), to monitor foreign exchange transactions, and financial institutions are no longer permitted to conduct any foreign exchange transactions without the approval of the CAD (“Resolución No. 92” 2004). According to Cuban authorities, one of the principal objectives of de-dollarization is to reduce the inequalities caused by the legalization of the U.S. dollar in 1993.3 After the dissolution of the Soviet Union and the Council for Mutual Economic Assistance (CMEA), Cuba lost access to key trading partners, and their generous subsidies (Mesa-Lago 1993). Merchandise exports fell 46%, from $3.5 billion in 1989 to $1.9 billion in 1993; and imports fell 51%, from $4.7 billion in 1989 to $2.3 billion in 1993 (Ritter 2003). This external sector shock resulted in a significant decline in hard currency earnings and the worst economic crisis in recent Cuban history (Ritter 2003). The crisis forced Cuba to procure hard currency to obtain essential inputs (e.g., foodstuffs, machinery, oil, and spare parts) in the international market, and prompted the Cuban leadership to embark on a survival strategy based on legalizing the U.S. dollar, attracting foreign investment, increasing family remittances, and expanding international tourism (Mesa-Lago 1993). The need to reduce monetary overhang, control the fiscal deficit, and arrest the devaluation of the Cuban peso in the second economy, played a significant role in the legalization of the U.S. dollar. Between 1989 and 1993, excess (monetary) circulation increased from 4.9 billion pesos, or 24% of gross domestic product (GDP), to more than 11.6 billion pesos, or 67% of GDP; the fiscal deficit expanded from 6.7% of GDP to 30.4% of GDP; and the black market exchange rate depreciated from 7 pesos per dollar to more than 160 pesos per dollar during the same period (Jatar-Hausmann 1999). The legalization of the U.S. dollar was also motivated by the need to expand Cuba’s tourism sector in order to earn more foreign exchange. Since the early 1990s, international tourism has been considered as one of the most promising areas of the Cuban economy (Lage 1992). Between 1990 and 2000, the number of visitors increased from 340,000 to 1,774,000, reflecting an average annual growth rate of 18% (CEPAL 2000; Mesa-Lago 2005; Rodríguez 2002). During the same period, gross hard currency receipts from tourism increased 682%, from $243 million to $1.9 billion; formal employment in the tourism sector grew 71%, from 39,200 to 68,000; and the number of hotel rooms for international tourists increased 100%, from 18,565 to 37,178 (CEPAL 2000). The need to attract remittances from abroad provided another reason for the legalization of the U.S. dollar. Annual remittances to Cuba increased from an estimated $630 million in 1996 to $811 million in 2003, and an estimated 62% of the island’s population receives remittances on a regular basis (CEPAL 2005; Mesa-Lago 2003). Since the majority of these funds are used for personal consumption at the “dollar stores,” the legalization of the U.S. dollar and the influx of remittances exacerbated the inequalities between those operating in the dollar and peso sectors (Barberia 2002; Blue 2004; González-Corzo 2006). Some studies (Seiglie 2004) suggest that the Cuban government enjoys a greater level of support from those sectors of the population with limited or no access to remittances from abroad. According to official sources, de-dollarization represents an attempt to reduce the existing (income) gaps and inequalities that exist between households functioning in the peso economy and those that somehow earn hard currency and/or receive remittances from abroad. In addition to de-dollarization, the Cuban government introduced a series of measures to (presumably) reduce existing inequalities. In May 2004, prices at the “dollar stores” were raised between 10% and 35%, with the objective of reallocating some of the resulting revenues to social programs, and increasing subsidies in the peso sector (CEPAL 2005). A month later, the monthly minimum wage was raised from 100 to 225 pesos, and monthly minimum pensions from 55 to 150 pesos (“Nuevos incrementos” 2005). In April 2005, the value of the convertible peso was increased by 8%, and a new “old” peso-convertible peso exchange rate was introduced.4 This last measure has benefited some 38% of the population that operates in the peso sector because they save two “old” pesos when buying convertible pesos, but has affected those that either hold U.S. dollars or convertible pesos because they lose two “old” pesos when they exchange either currency into “old” pesos, and $0.17 for each dollar exchanged for convertible pesos. De-dollarization also appears to have been motivated by declines in foreign exchange receipts due to falling sugar output, a slowdown in international tourism, and the impact of natural disasters during the 2000– 2004 period. Sugar production declined 60%, from 4.0 million tons in 2000 to 2.5 million tons in 2004. In 2002, the Cuban government announced a plan to restructure the sugar industry, calling for a 50% reduction in the area dedicated to sugarcane cultivation, downsizing the workforce, and shutting down inefficient mills (Valenzuela 2002; Varela Pérez 2002). As a result of this plan, the area used for sugarcane cultivation fell 33%; the lands under irrigation declined 40%; and sugar yields fell 46% (Mesa- Lago 2005). Even though sugar production increased from 3.5 million tons in 2001 to more than 3.6 million tons in 2002, output was 54% lower than the 8.1 million tons produced in 1989 (Pérez-López 2004). This trend continued in 2003 and 2004, with sugar production reaching 2.2 million tons, and 2.5 million tons, respectively. 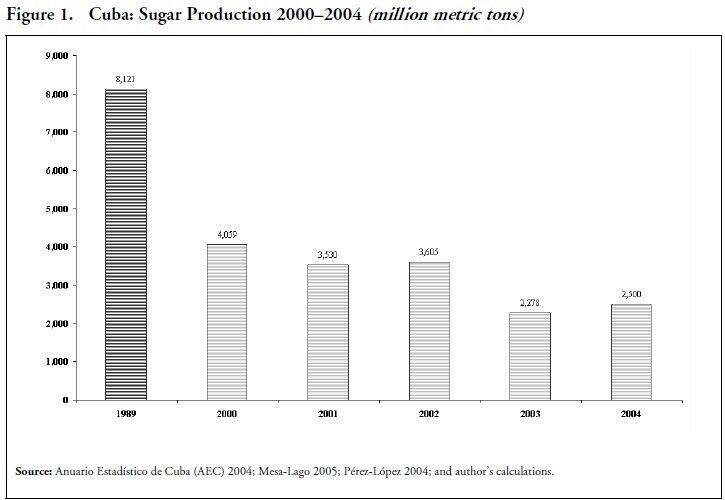 Figure 1 illustrates Cuba’s sugar production during the 2000–2004 period. Cuba’s foreign exchange receipts were also affected by a slowdown in international tourism during 2000–2004. Turist arrivals fell 6%, from 1,775,000 in 2001 to 1,656,000 in 2002; gross hard currency receipts declined 5.5%, from $1.8 billion to $1.7 billion; and hotel occupancy rates fell from 74% in 2000 to 57% in 2002. Although the number of visitors recovered in 2003 and 2004, the annual growth rate declined 46%, from 14.7% to 7.9%. The annual growth rate for gross hard currency earnings also declined between 2003 and 2004, reflecting the higher costs of servicing the tourism sector. Table 1 presents Cuba’s principal tourism indicators during the 2000–2004 period. The impact of five hurricanes, and the worst drought in a century dealt a devastating blow to the Cuban economy during 2000–2004. In 2001, Hurricane Michelle affected 45% of the national territory, and 53% of the population (Pérez-López 2002). The losses caused by this natural disaster were estimated at 1.8 billion pesos, or 6% of GDP (Pérez-López 2002). Cuba was hit by Hurricanes Isidore and Lili in 2002, and Hurricanes Charley and Ivan struck in 2004, causing an estimated $2 billion in damages, destroying more than 54,000 hectares of crops, and damaging some 100,000 residential structures (Mesa- Lago 2005). The island experienced the worst drought in its recent history during 2003 and 2004. In 2004, the average rainfall recorded was 69% below the normal average, and the losses caused by the drought exceeded $800 million (Rodríguez 2004). The Institute for Hydraulic Resources indicated that 15 out of 73 dams used to provide water for the population had exhausted their reserves by early 2005, and close to two million people were affected by the lack of water (Mesa-Lago 2005). The deterioration of Cuba’s macroeconomic performance during 2000–2004 seems to be another possible reason for de-dollarization. The island’s GDP growth rate fell from 6% in 2000 to 3% in 2001, and 1% in 2002 (CEPAL 2005; Mesa-Lago 2005; Pérez- López 2004). Although GDP expanded 2% in 2003, and 3% in 2004, these figures overstate actual growth because the base year for estimating GDP in constant prices was changed in 2001 (Mesa-Lago 2005).5 Gross capital formation fell 9.7%, from 13.3% of GDP in 2001 to 12% in 2002; and the cost of natural disasters and increases in social spending raised the fiscal deficit from 2.5% of GDP in 2001 to 3.4% in 2003, and 4.2% in 2004 (CEPAL 2005). Table 2 presents Cuba’s principal macroeconomic indicators during 2000–2004. Cuba’s worsening economic conditions during 2000–2004 were reflected in the performance of the external sector. Merchandise exports fell 0.8% in 2001 and 13% in 2002, reducing foreign exchange earnings and the island’s ability to obtain imports. Although the value of merchandise exports reached 1.6 billion pesos in 2003, representing an increase of 14% over 2002, this amount was 69% lower than the 5.4 billion pesos exported in 1989. Merchandise exports increased to 2.2 billion pesos in 2004, but were still 59% below 1989 levels. Cuba’s hard currency debt grew slightly during the 2000–2004 period, and remittances continued to play a key role as a primary source of convertible currency. 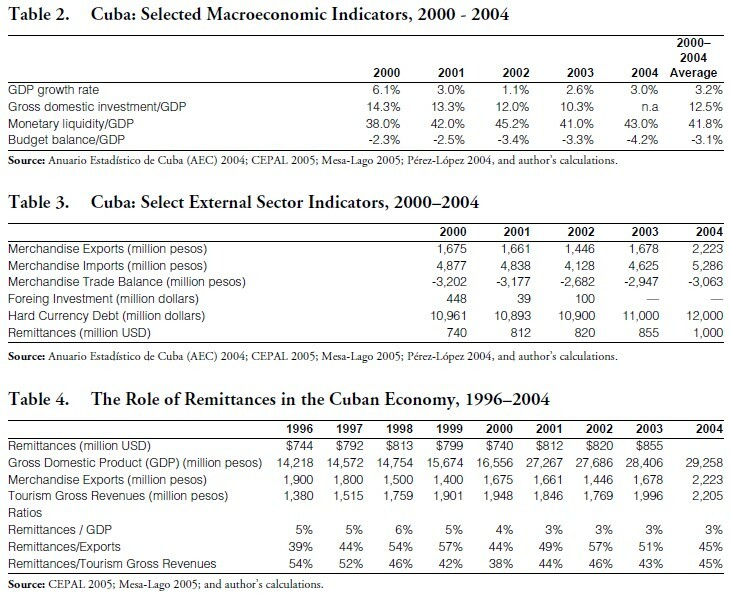 Table 3 presents Cuba’s principal external sector indicators during 2000–2004. The state’s desire to capture a larger share of the convertible currency generated by the influx of remittances appears to be another possible motive for dedollarization. In the early 1990s, Cuba embarked on a two-tiered strategy to attract remittances from abroad. The first part of this strategy consisted of the legalization of the U.S. dollar (1993), the expansion of the “dollar stores” (in 1993), and the creation of government-run foreign exchange bureaus (or CADECA, S.A.) (in 1995) (Barberia 2002). The second tier consisted of the transformation of the banking sector (in 1997), and the expansion and modernization of the formal infrastructure to process remittance payments (1999) (Barberia 2002). As a result of these measures, family remittances increased from $744 million in 1996 to an estimated $1 billion in 2004; and the ratio of remittances to merchandise exports increased from 39% to 45% (CEPAL 2001, 2002, and 2005). Table 4 summarizes the importance of remittances in the Cuban economy. The growing importance of remittances in the Cuban economy contributed to the expansion of formal channels, online money transfer agents, and other service providers (Barberia 2002). Despite the growth of these formal channels, mulas, or informal money couriers, accounted for a significant share of remittances sent to Cuba (Orozco 2003; Puerta 2003) prior to the implementation of new U.S. travel and remittance restrictions (RTRs) on June 30, 2004. In 2002, remittances to Cuba reached an estimated $800 million, or 8% of the total for Central America and the Caribbean (Orozco 2003). Approximately 46% of this amount ($377 million) was sent via informal couriers; 30% ($240 million) was sent through Western Union; and the rest ($183 million) was sent using other channels, including online service providers (Orozco 2003). The approval of Resolution No. 65 on July 21, 2003 marked the beginning of Cuba’s “de-dollarization program.” Resolution No. 65 established the convertible peso (CUC) as the only acceptable method of payment for all business entities operating in the island’s hard currency sector; required all firms to convert their dollar holdings into convertible pesos; and granted the Banco Central de Cuba (BCC) complete control over all foreign exchange transactions. These measures were followed by the approval of Resolution No. 80 on October 23, 2004. Resolution No. 80 imposed a 10% surcharge on all exchanges of U.S. dollars for convertible pesos and “old” Cuban pesos; prohibited additional U.S. dollar deposits in existing bank accounts (with some exceptions); and required all entities that had previously accepted U.S. dollars to only accept convertible pesos. The approval of Resolution No. 92 on December 2004 accelerated the process of de-dollarization by centralizing all foreign exchange transactions greater than $5,000 under a single hard currency account monitored by the Central Bank. This was followed by issuance of Directives 13 and 15 on March 2005. Directive 13 established a new exchange rate between the “old” peso and the convertible peso, and Directive 15 established a new official exchange rate of $1.08/1CUC after April 9, 2005. According to official sources, de-dollarization was primarily motivated by the desire to reduce the inequalities caused by the legalization of the U.S. dollar in 1993, and as a means to compensate Cuban financial institutions for the risk of holding and transacting in U.S. dollars in an “increasingly hostile environment” (“Resolución No. 80” 2004). Contrary to this assertion, however, de-dollarization seems to have been motivated by the scarcity of hard currency (or foreign exchange) caused by declines in sugar output, a slowdown in international tourism, the impact of natural disasters, deteriorating macroeconomic conditions, and poor external sector performance during 2000–2004. Given the important role of remittances in the Cuban economy, the need to increase the state’s earnings from this activity, and partially replace informal money couriers with online remittance service providers, appears to be another possible motive for de-dollarization. 1. The term “dollar stores” refers to the nationwide network of state-run Tiendas de Recaudación de Divisas (TRDs) established in 1995, known in the popular lexicon as “la shopin,” where Cuban citizens, foreign residents, and tourists can purchase a wide range of consumer products using the U.S. dollar. The approval of Resolution No. 80 on October 23, 2004, replaced the U.S. dollar with the Cuban convertible peso; therefore, the terms “convertible peso stores” or “hard currency stores” provide a more current definition of these establishments. 2. For example, someone wishing to convert $100 into convertible pesos after April 9, 2005, would receive 92.59 CUC at the official exchange rate of $1.08 per 1CUC. Resolution No. 80 (2004) stipulates that such conversion is subject to a surcharge of 10%, which equals 9.26CUC (92.59 multiplied by 10%) in this case. As a result, he or she only receives 83.33CUC, or an effective exchange rate of $0.8333 per 1CUC. 3. The U.S. dollar was legalized after the approval of Decree-Law No.140 in September 1993. 4. See “Acuerdo 13,” 2005. Havana: Banco Central de Cuba, March 17. 5. 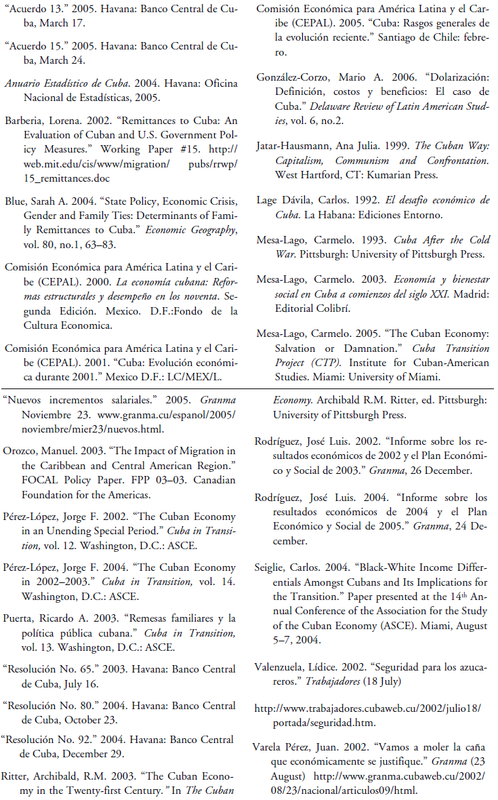 Mesa-Lago (2005) argues that the GDP growth figures officially reported by Cuban sources are distorted due to several reasons. First, the 1981 base used to calculate GDP at constant prices was changed to a 1997 base starting in 2001; this resulted in a 60 percent increase in the value of GDP reported for each year during 1996–2000. Second, Cuban officials have publicly criticized the conventional (international) methodology to estimate GDP, arguing that it ignores the value of the free social services and subsidies provided by the state, and made some changes to the methodology that have tended to increase the rate of growth reported by Cuba. 6. At the present time, remittances sent via Internet-based service providers (e.g., www.cash2cuba.com, www.familyremittances.com, etc. ), many in which the Cuban government has sizable interests, are exempt from the 10% surcharge stipulated by Resolution No. 80. As a consequence, these (alternative) formal channels enjoy a 10% cost advantage over their competitors.